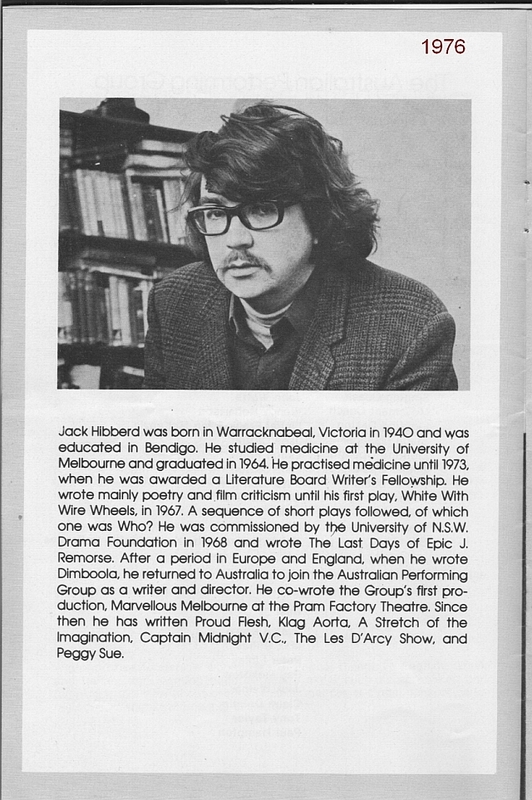 Most of the filming of “Dimboola” took place in and around the small Victoria township of Dimboola. 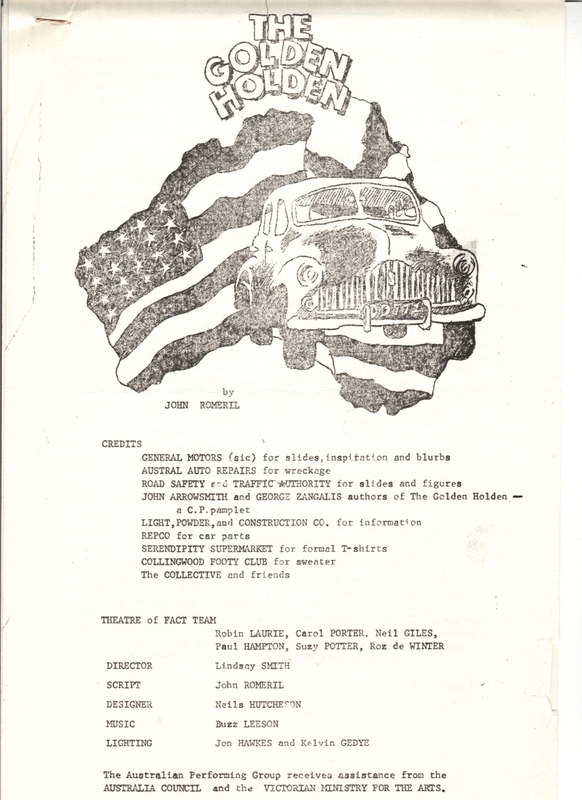 For those few weeks the people of Dimboola took a great deal of interest in the filming, with some even taking part as extras in the movie. 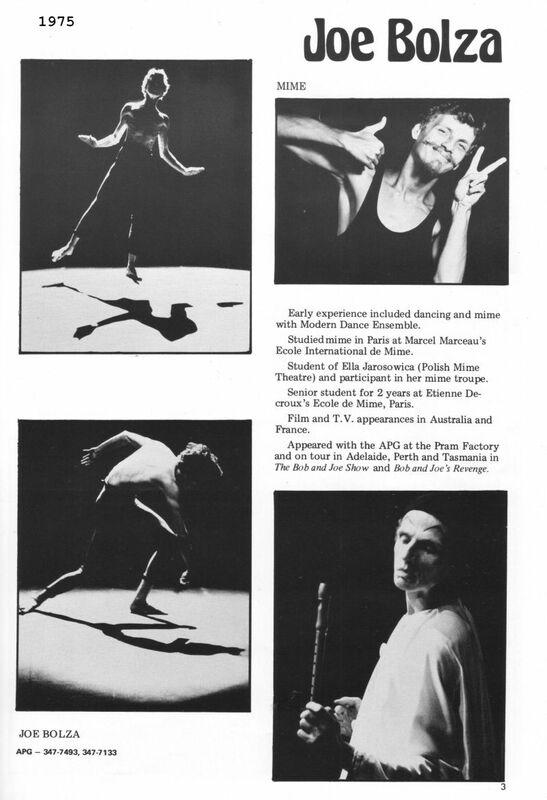 The local paper, The Dimboola Banner, published several articles about the event which were accompanied by photos taken by the film’s stills photographer, Ponch Hawkes. 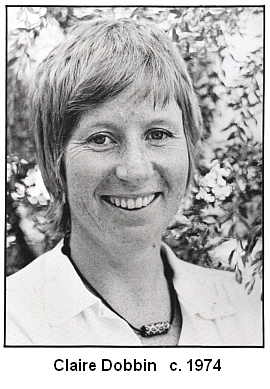 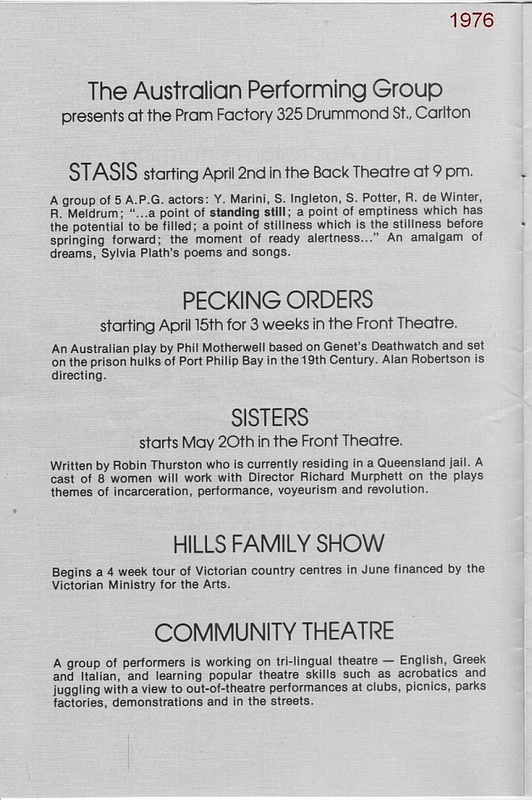 The following images and articles are from The Dimboola Banner, Friday, June 2, 1978. 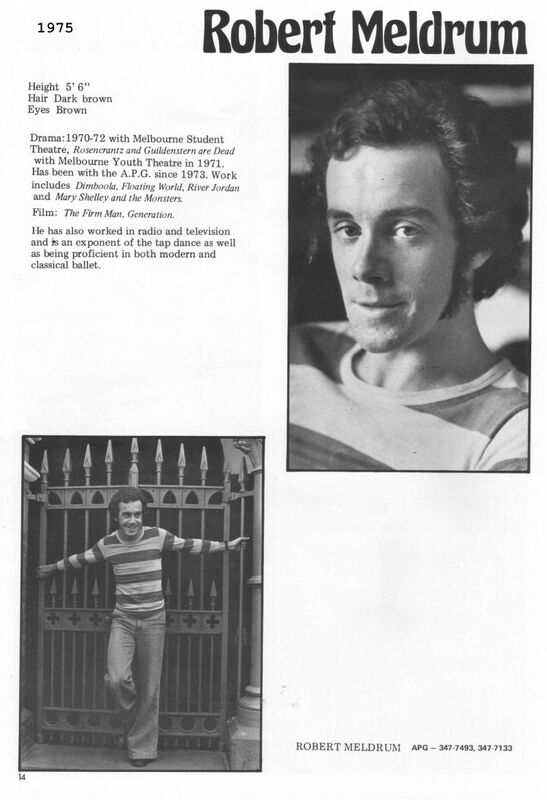 Most of the filming of “Dimboola” took place in and around the small Victoria township of Dimboola. 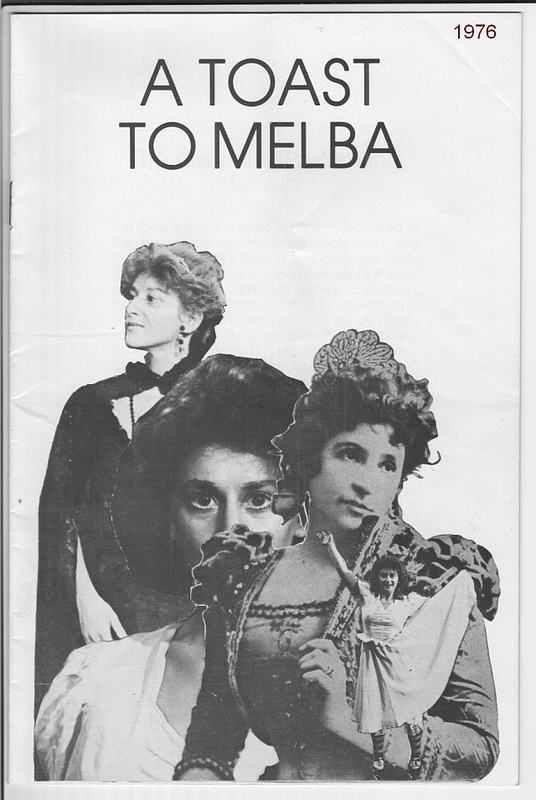 For those few weeks the people of Dimboola took a great deal of interest in the filming, with some even taking part as extras in the movie. 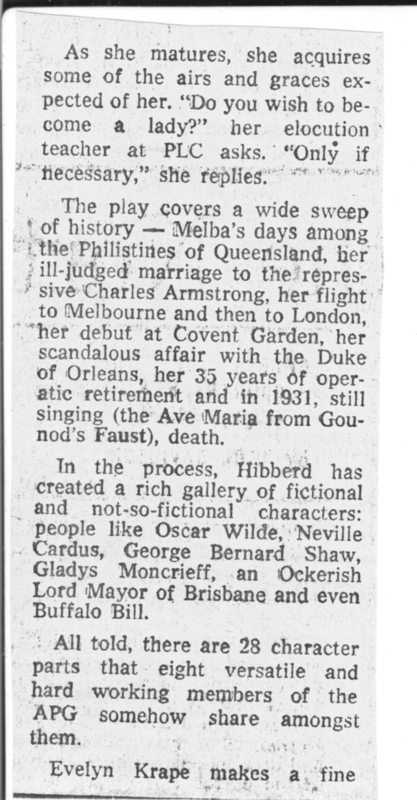 The local paper, The Dimboola Banner, published several articles about the event which were accompanied by publicity photos taken by the film’s stills photographer, Ponch Hawkes. 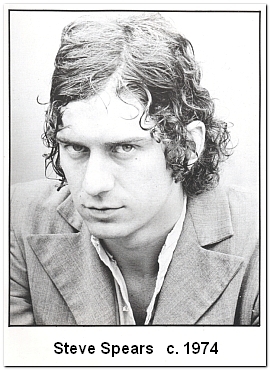 This is the SECOND of four post on this subject. 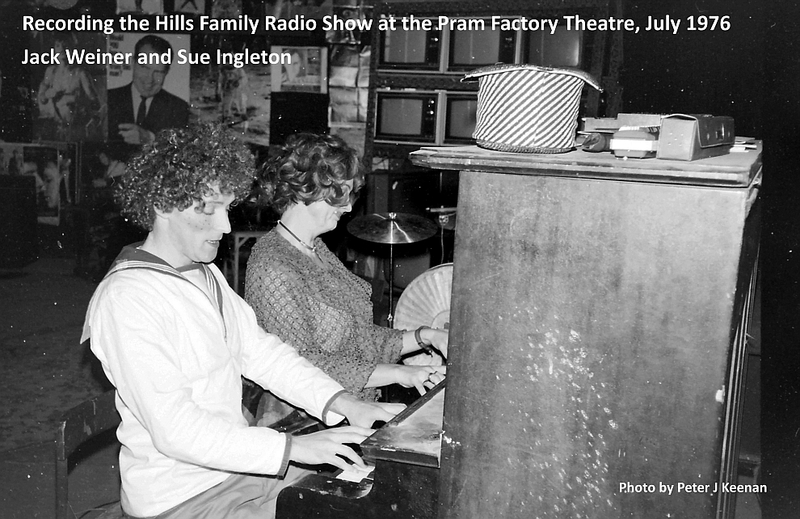 Joe Bolza, Eileen Chapmen, Jane Clifton, Roz deWinter, Claire Dobbin, Bill Garner, Neil Giles, Max Gillies, Sue Ingelton, Evelyn Krape, Wilfred Last, Yvonne Marini, Robert Meldrum, Fay Mokotow, Greig Pickhaver, Carol Porter, Susy Potter, Michael Price, Tim Robertson, Tony Taylor and Bob Thorneycroft. 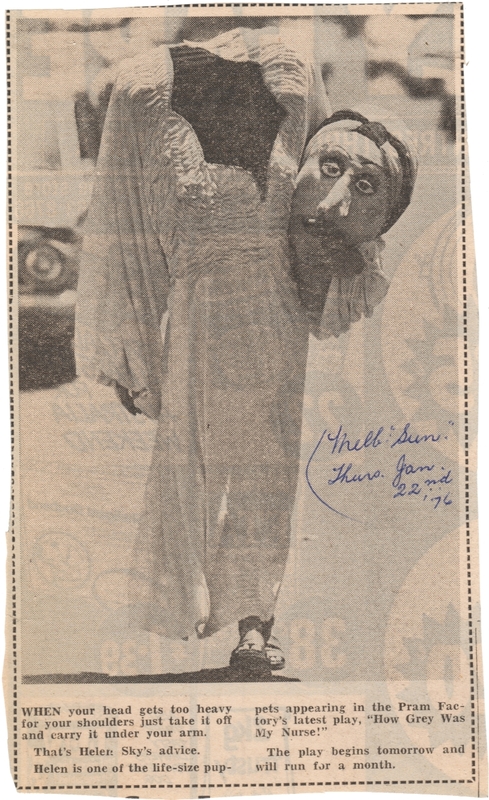 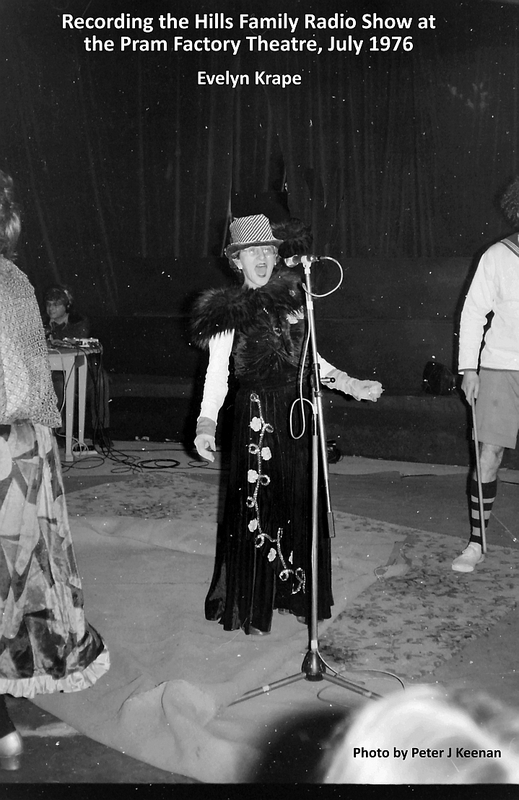 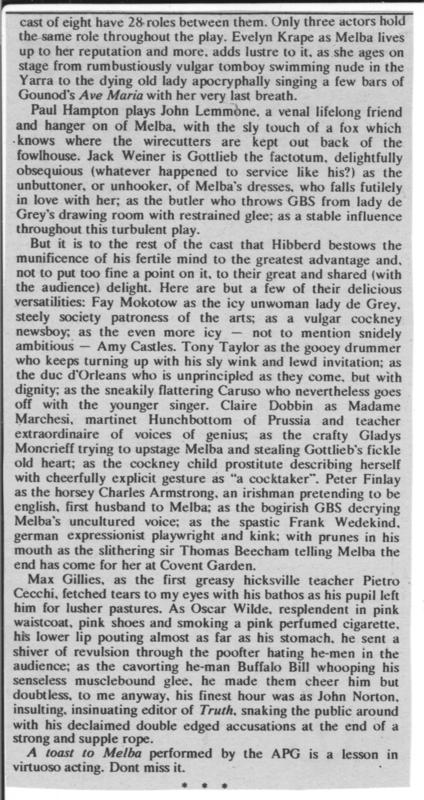 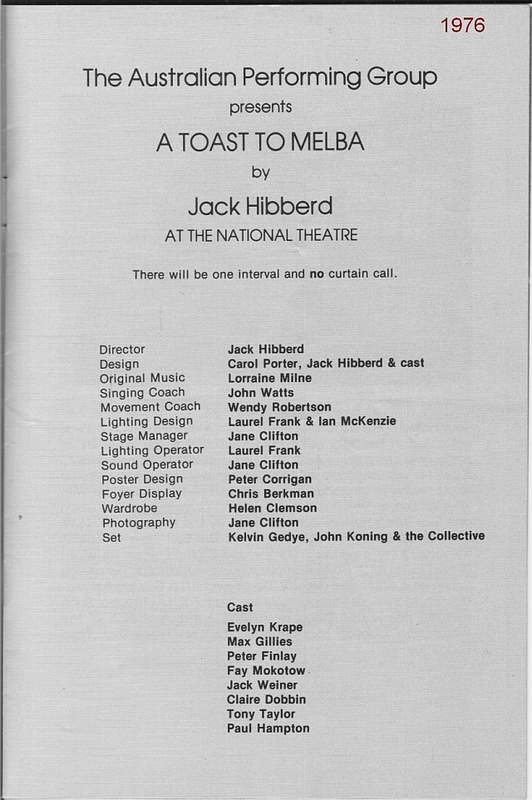 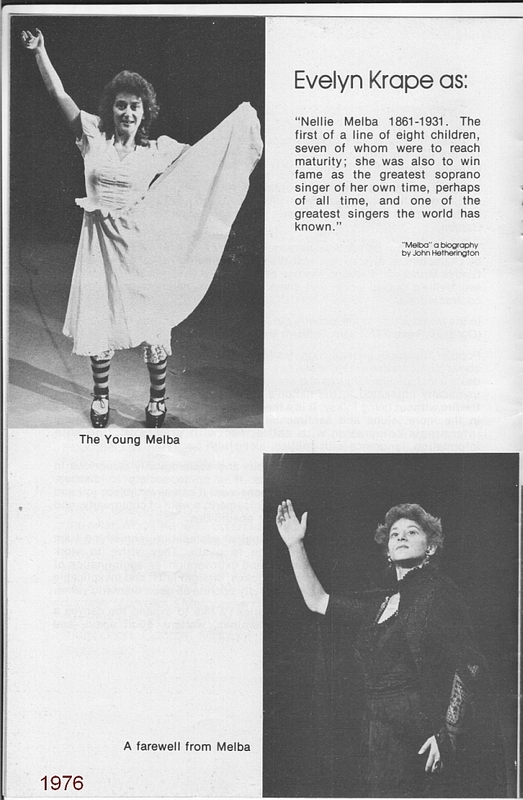 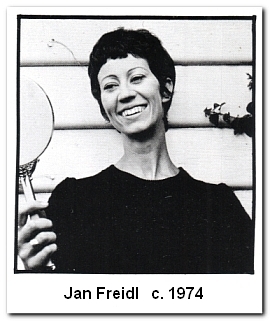 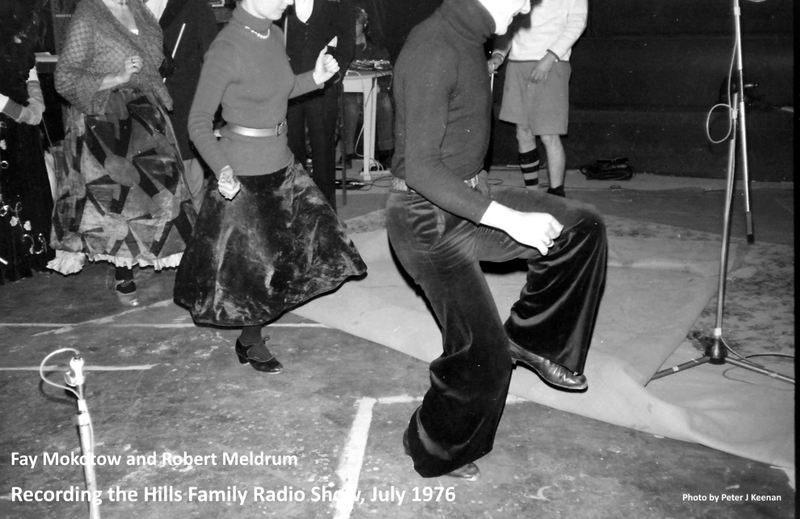 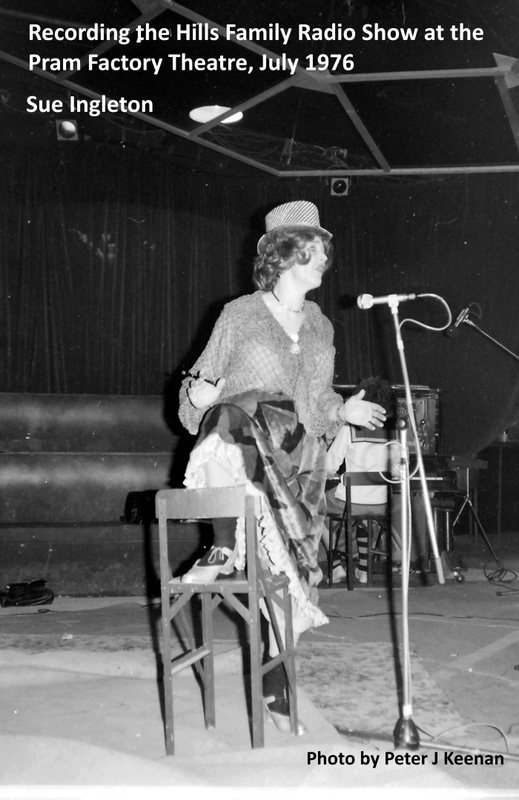 The Australian Performing Group performed “A Toast to Melba”, its new play by Jack Hibberd, at the Adelaide Festival of Arts in March 1976 and received high praise from critics. 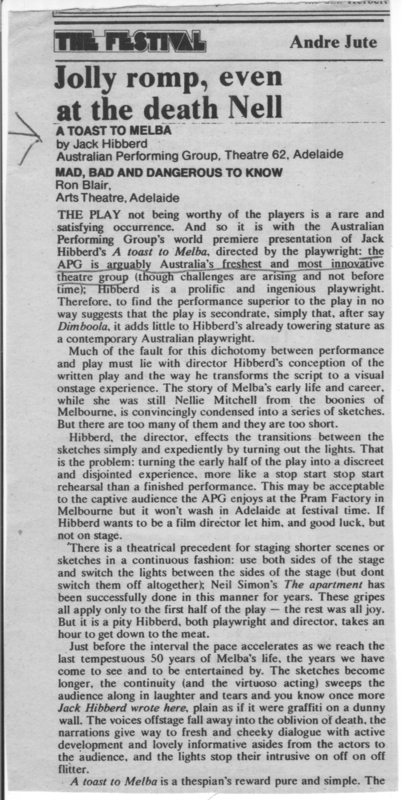 Here are the reviews by Leonard Radic (The Age), Garrie Hutchinson (The Australian), Andre Jute (Nation Review) and The Bulletin’s critic. 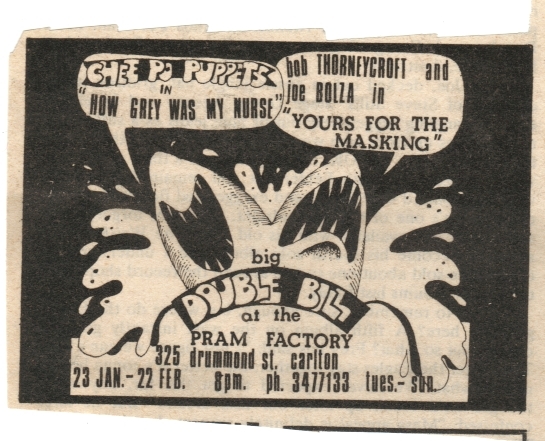 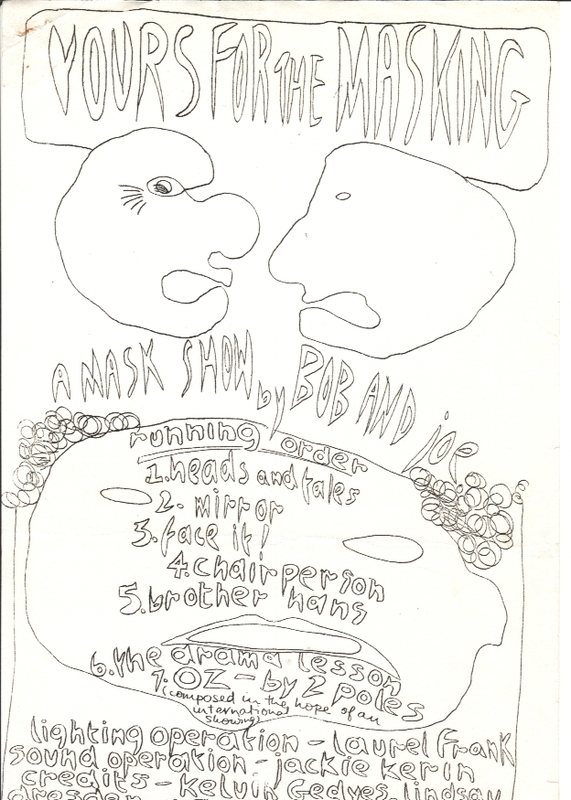 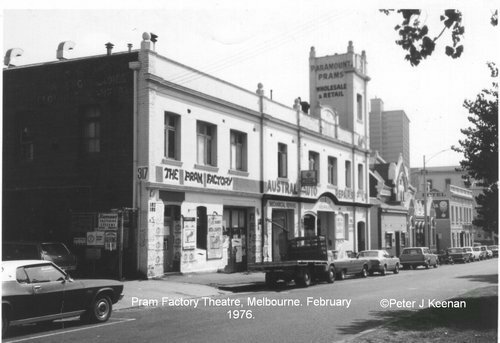 Presented as a double bill at the Pram Factory theatre, “Yours for the Masking” and “How Grey was my Nurse” ran from the 23/1/76 to 22/2/76. 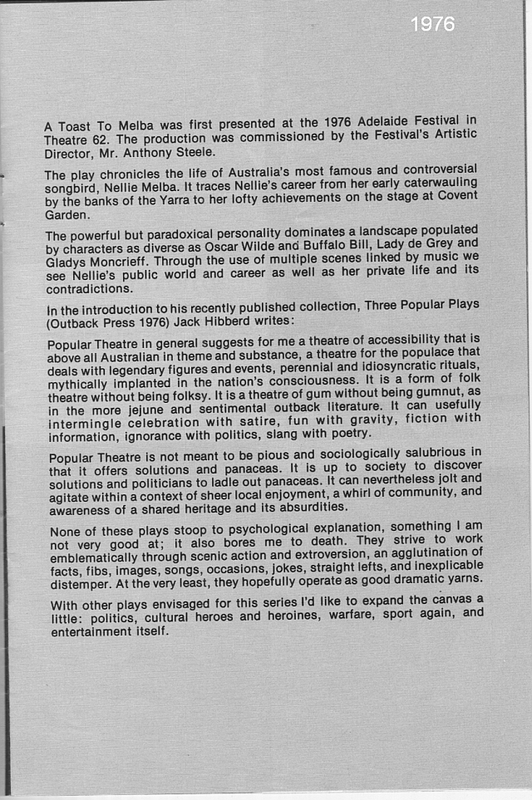 The images that appear here are: a display advertisement for the production; the first two pages of a programme prepared for those attending; a newspaper photograph for promotional purposes; a review of the two shows by Robin Prentice for the Nation Review; and a photo by me of the Pram Factory theatre in February 1976. 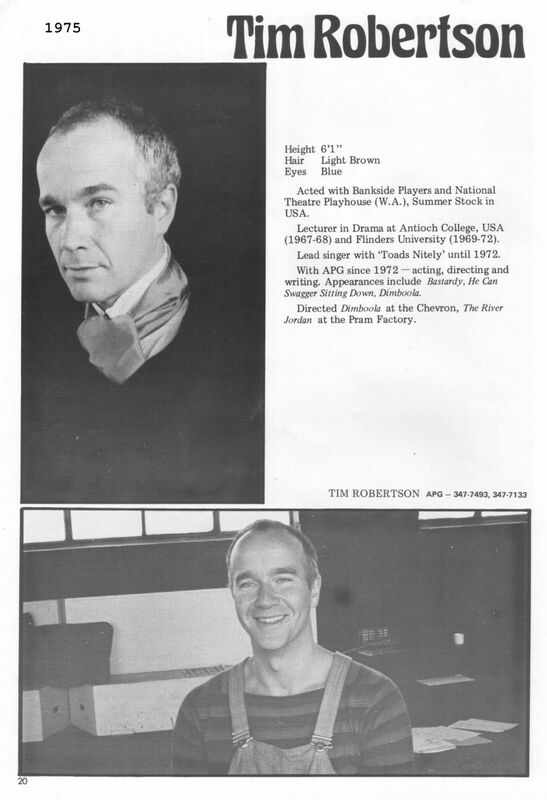 “The Golden Holden” by John Romeril. 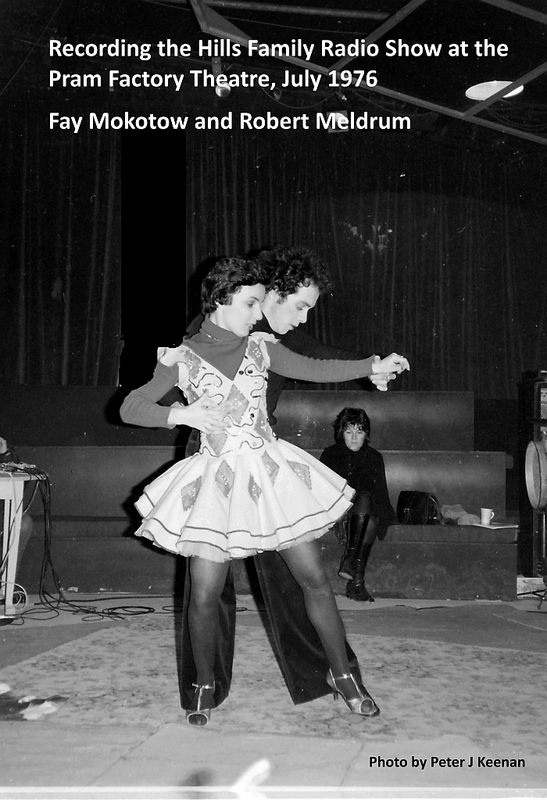 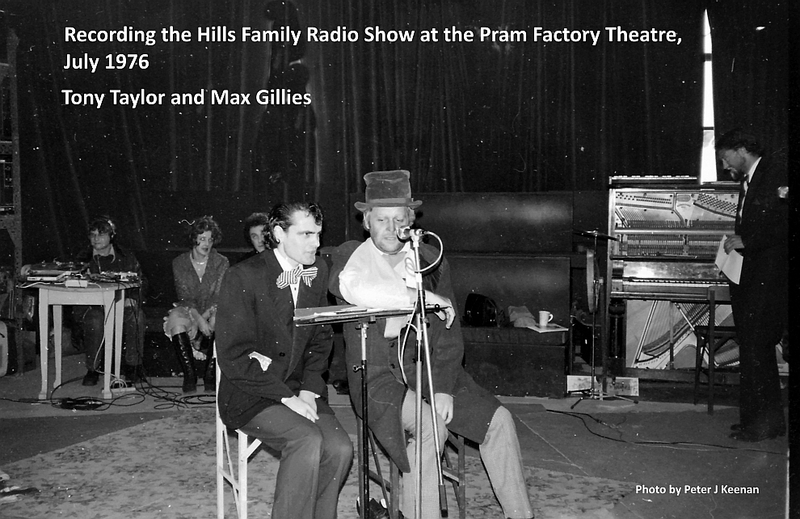 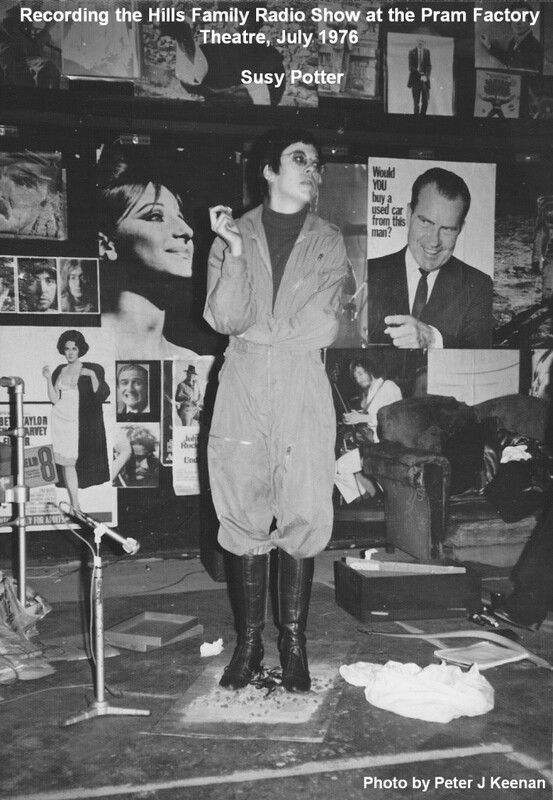 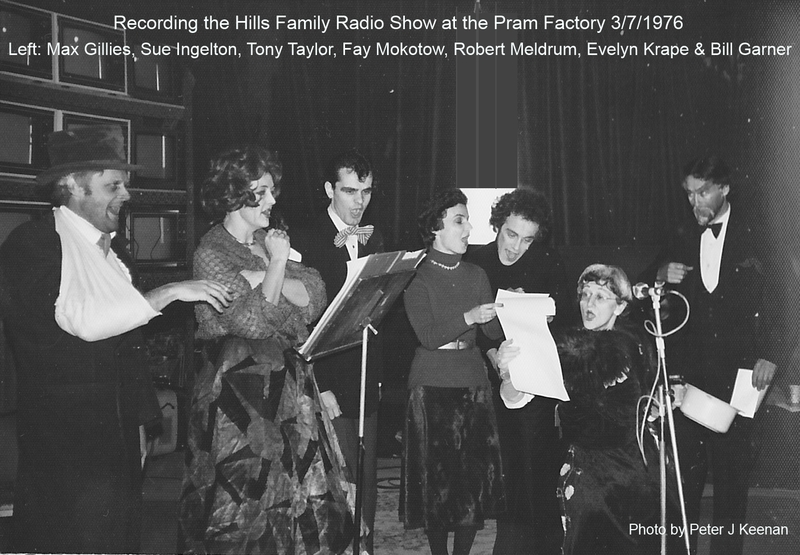 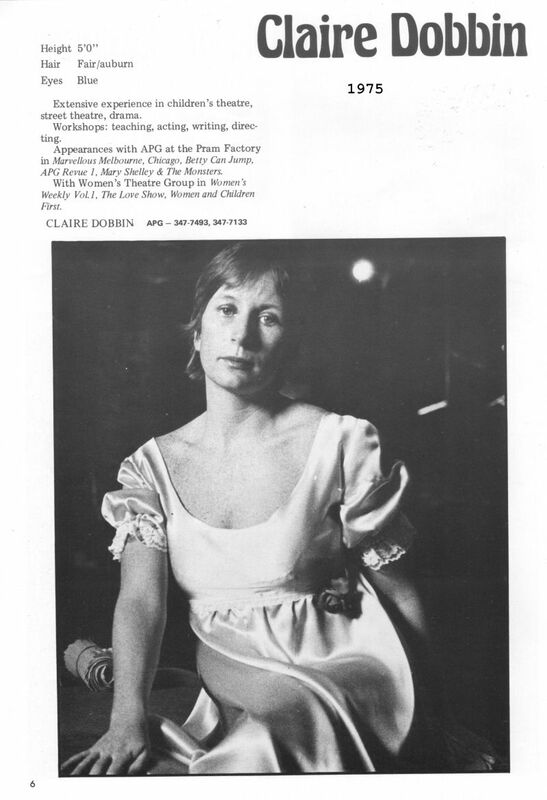 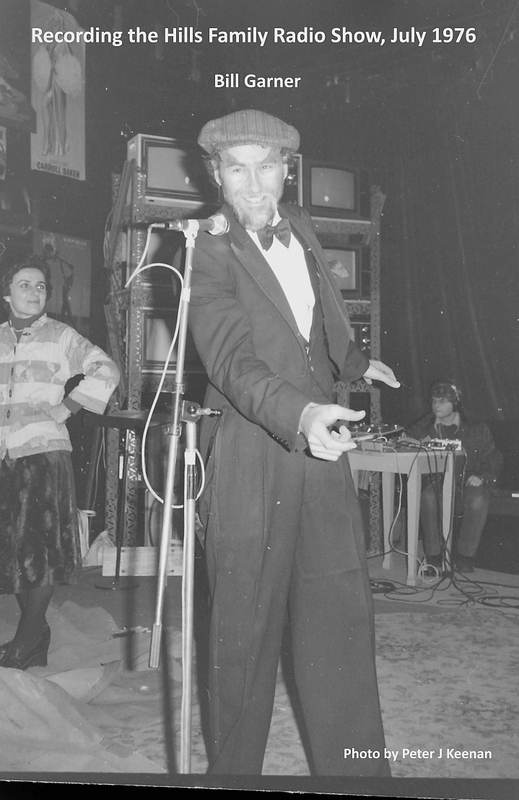 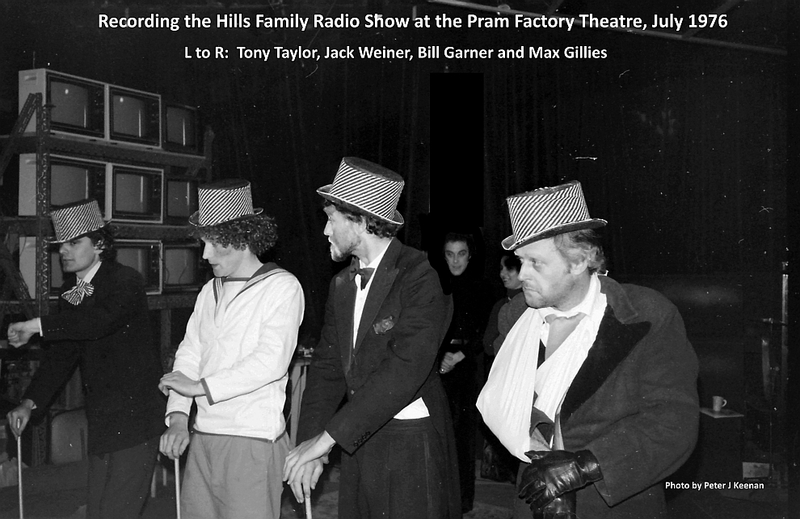 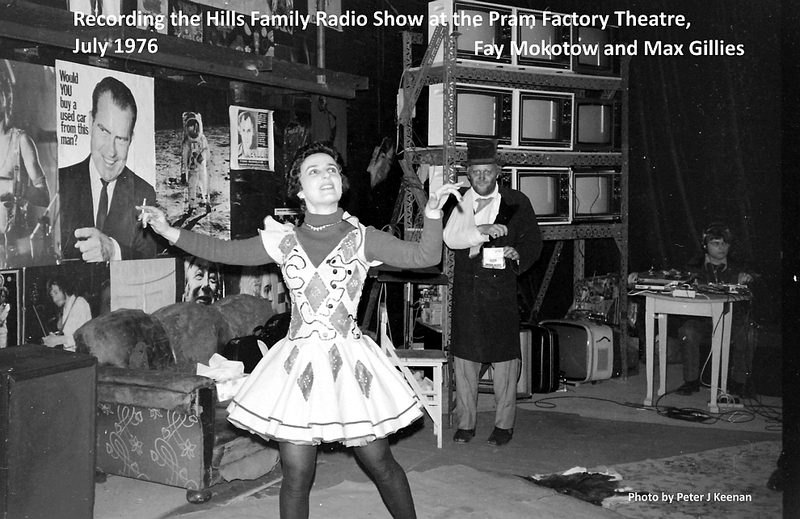 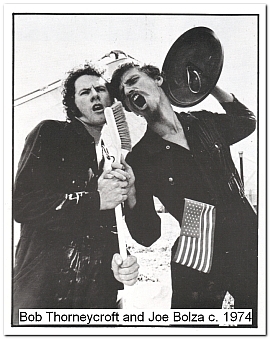 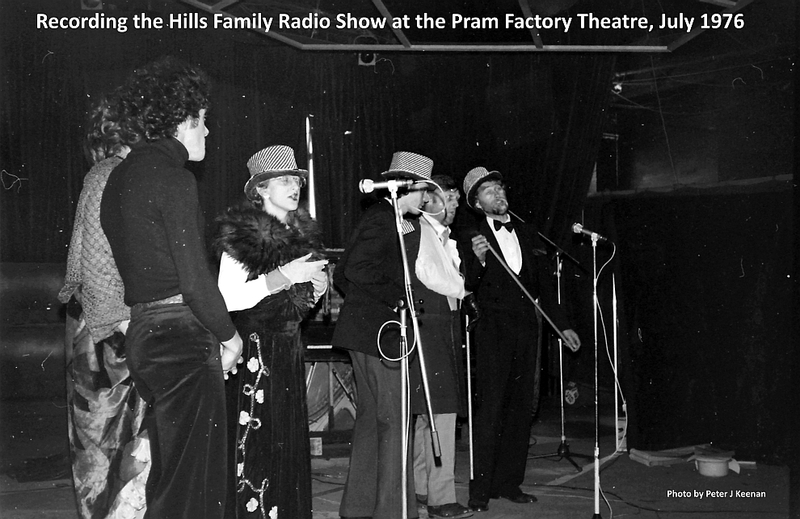 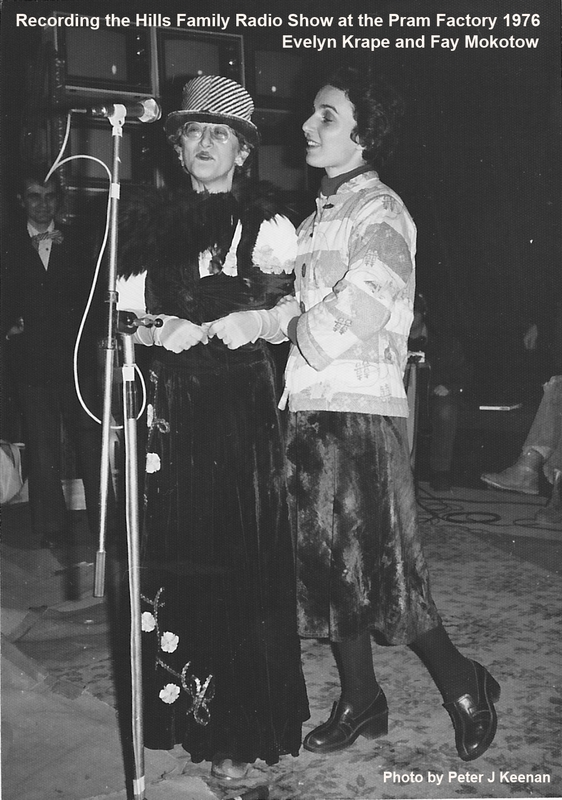 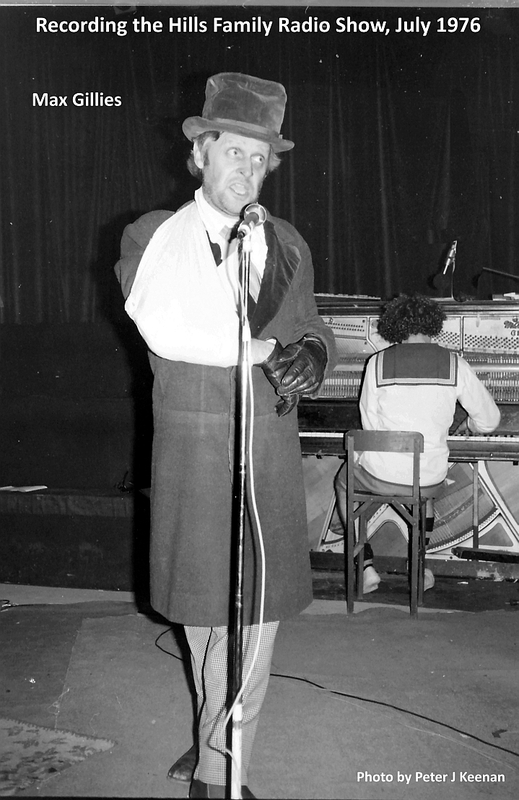 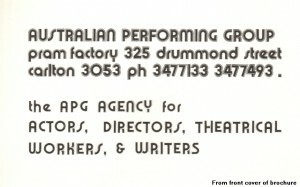 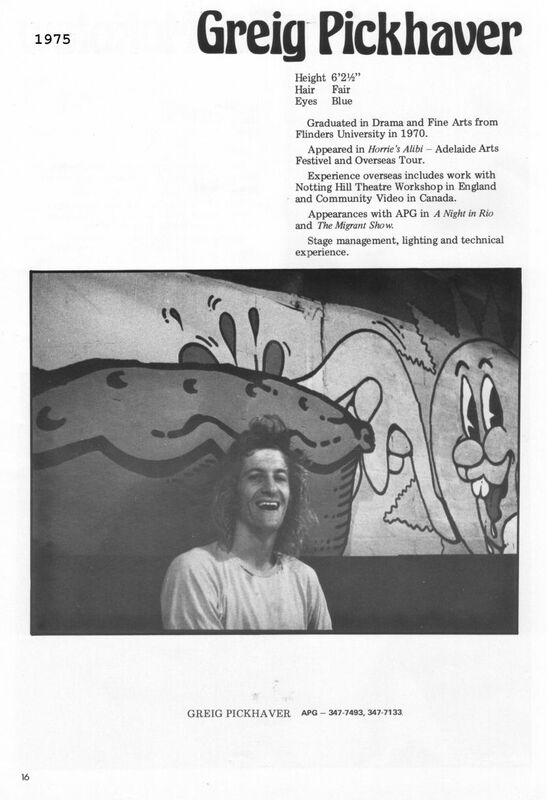 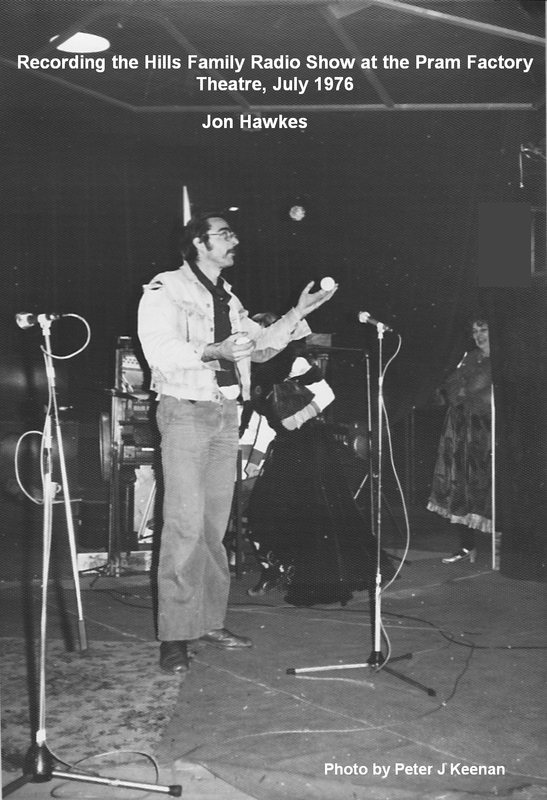 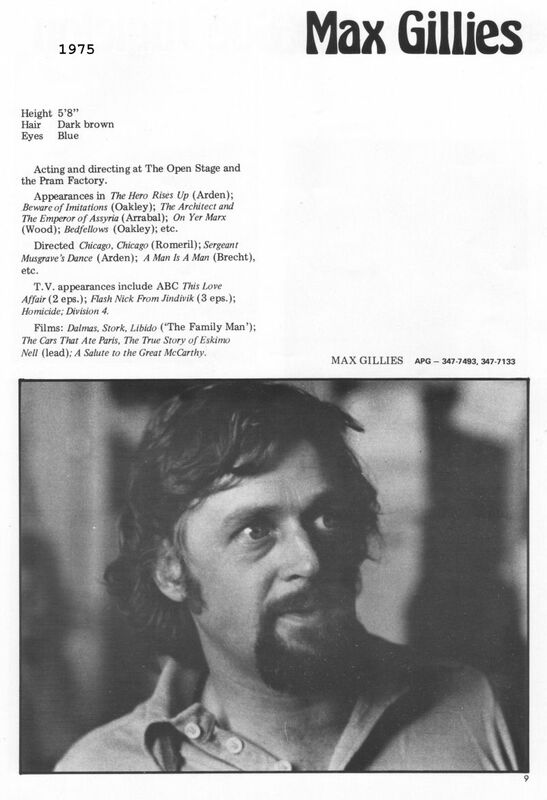 The APG performed “The Golden Holden” at the Pram Factory theatre in December 1975 and January 1976. 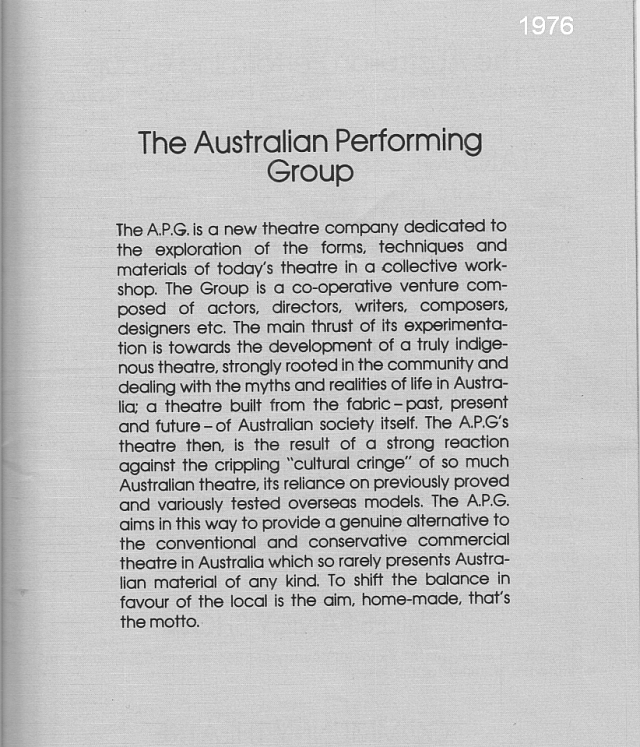 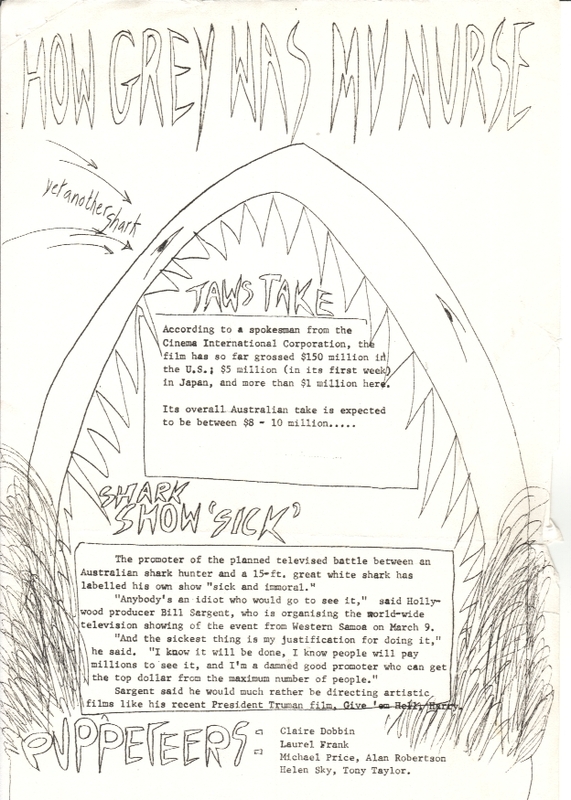 Shown here is a 2-page promotional leaflet prepared by the APG. 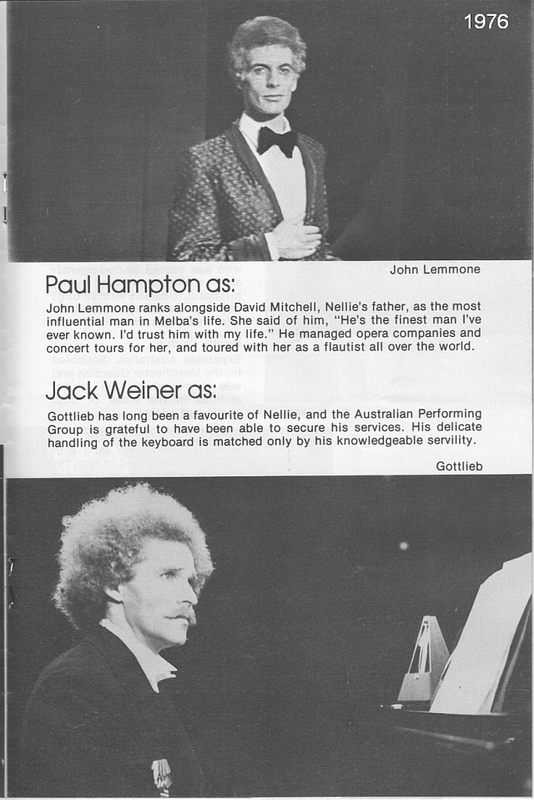 On page 2 of the leaflet is a piece written by John Romeril titled “The Genesis of ‘The Golden Holden'”. 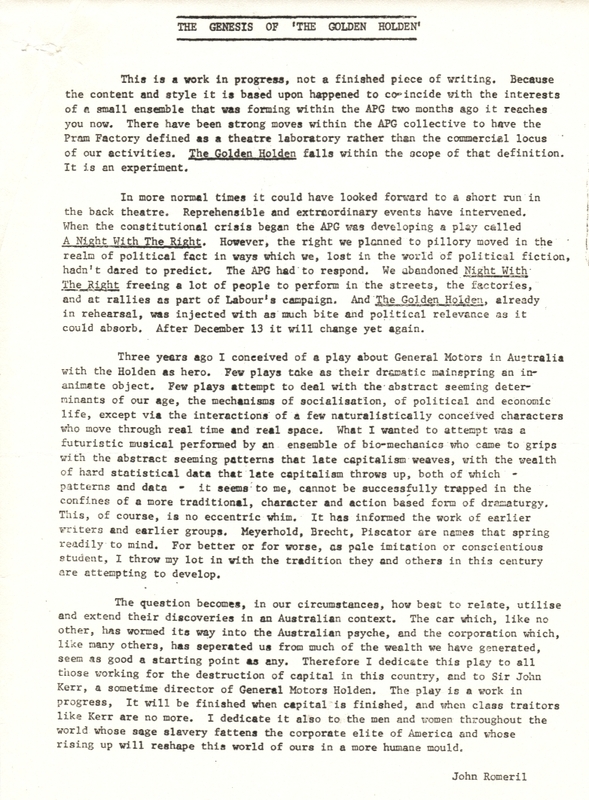 Romeril’s piece touches on the great political turmoil in Australia at the time. 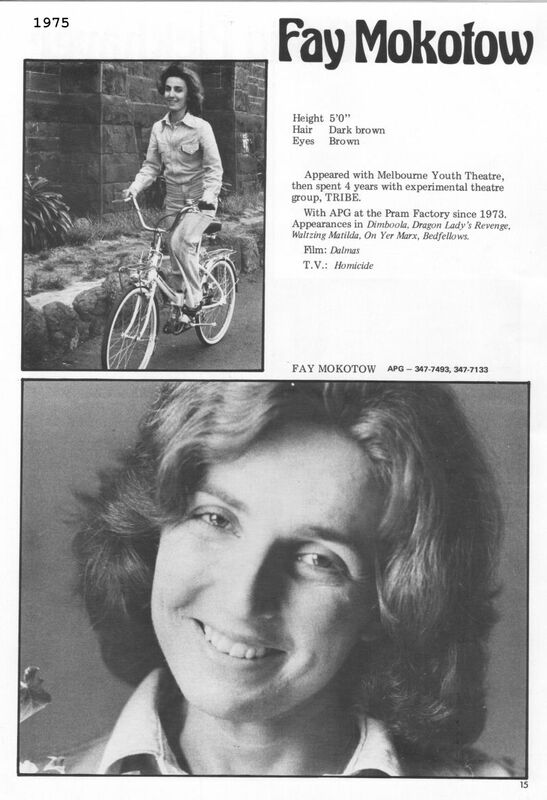 On 11 November 1975 the Whitlam Labor Government was dismissed by the Governor-General in controversial/baffling circumstances, and the election on 13 December 1975 was won by the Liberal/National Country Party coalition. 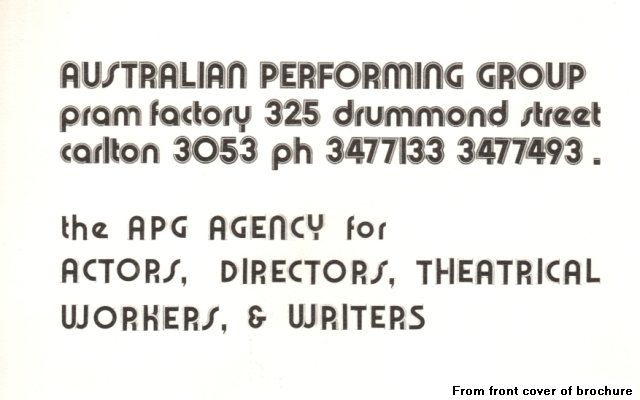 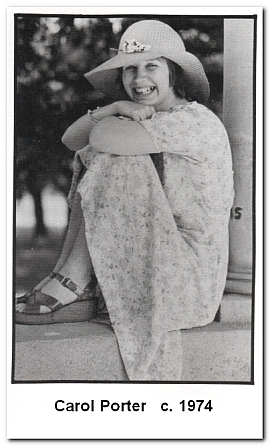 For Romeril’s amusing and valuable memoir of the APG – “Last Words on a Nearly Made It Theatre: Memoir of a Survivor” – click HERE. 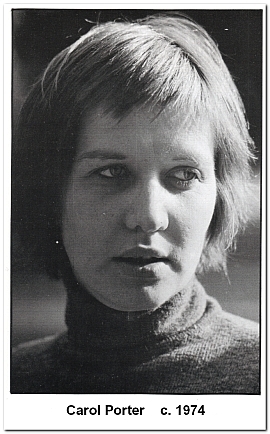 Photographs of Bill Garner, Bob Thorneycroft, Joe Bolza, Carol Porter, Claire Dobbin, Evelyn Krape, Fay Mokotow, Jane Clifton, Jan Freidl, Jon Hawkes, Max Gillies, Roz DeWinter, Steve Spears, Tim Robertson and Yvonne Marini. 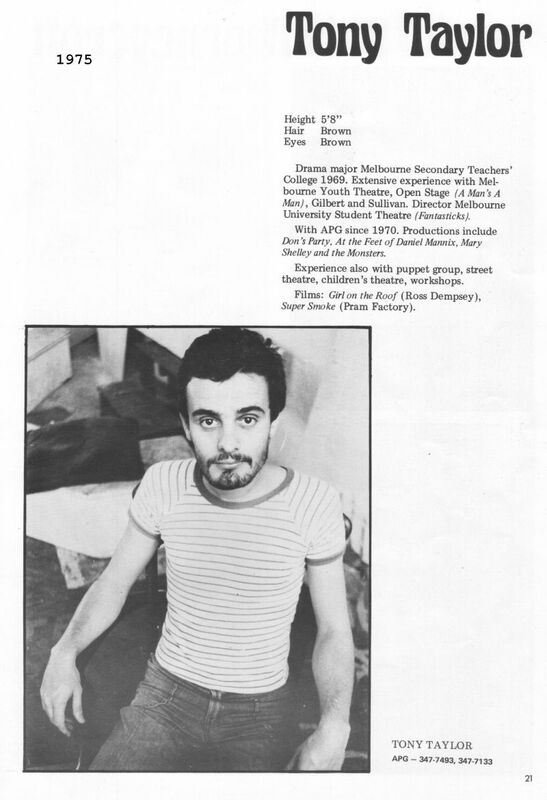 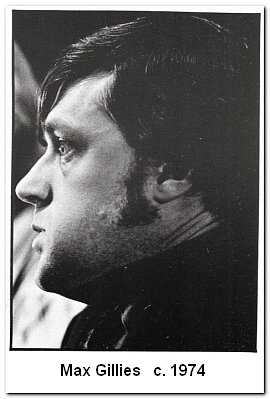 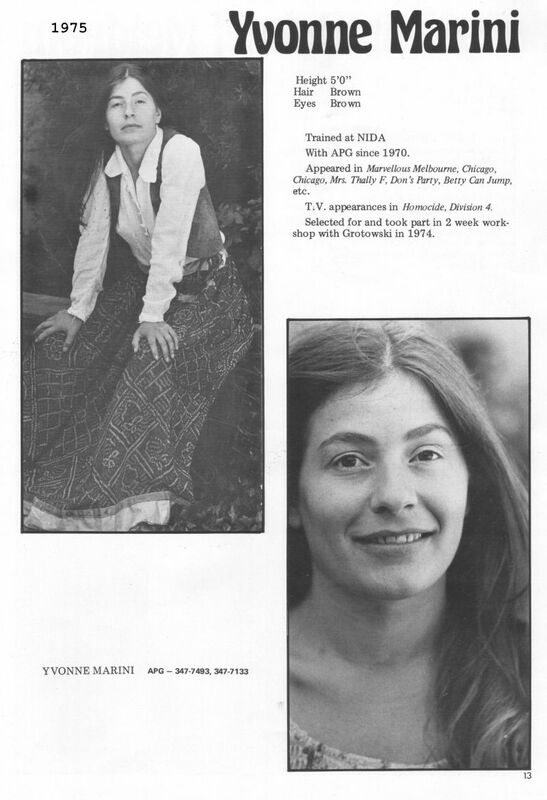 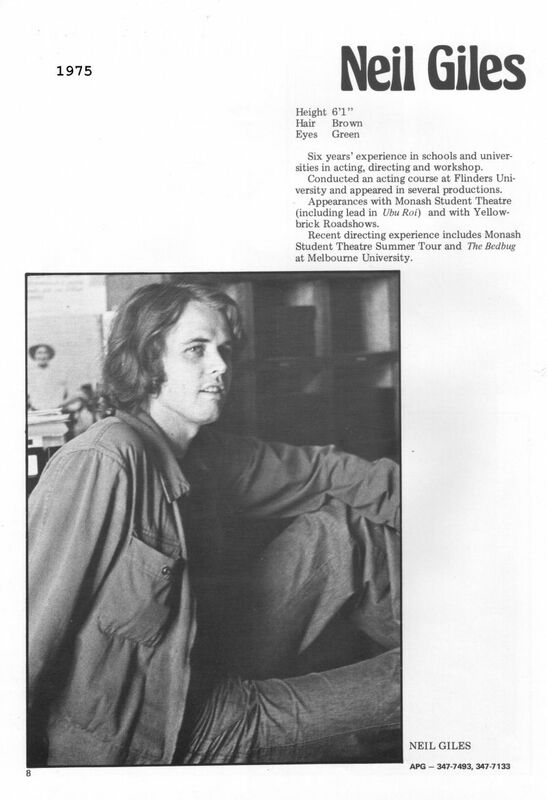 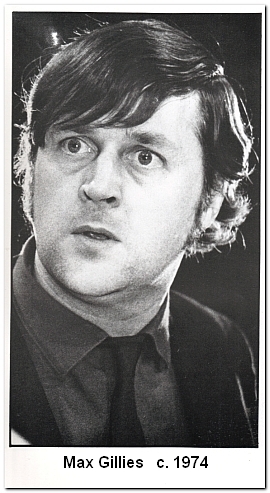 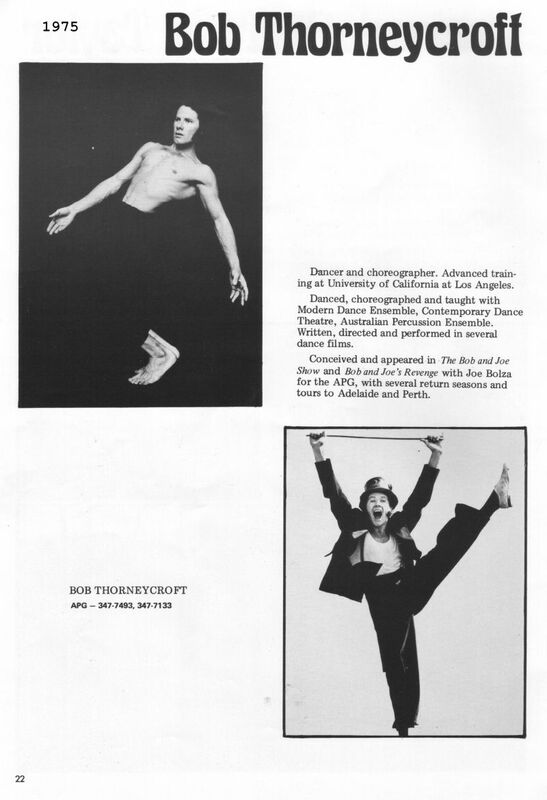 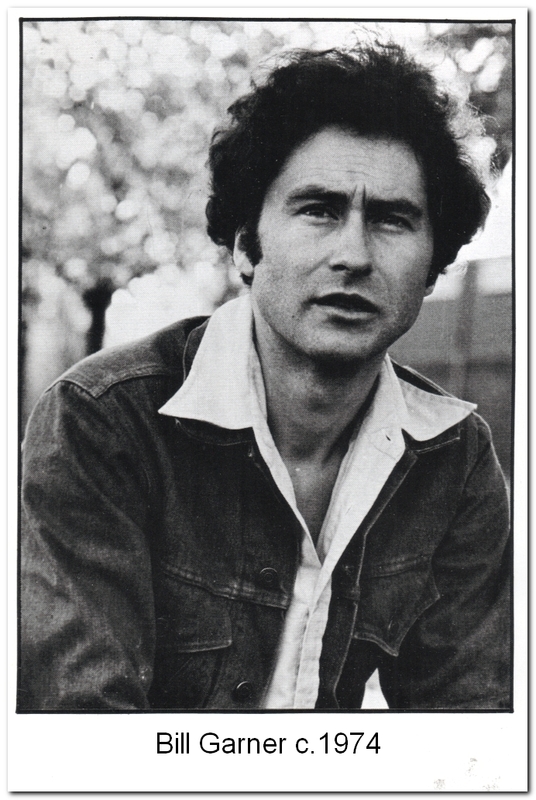 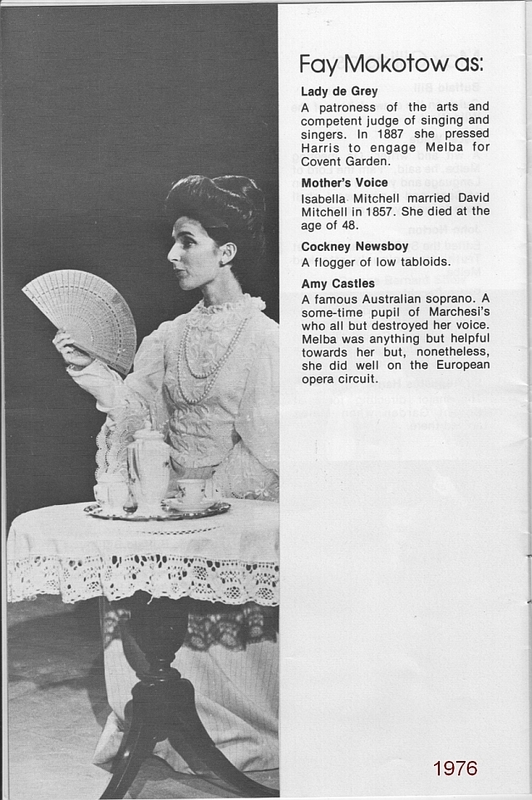 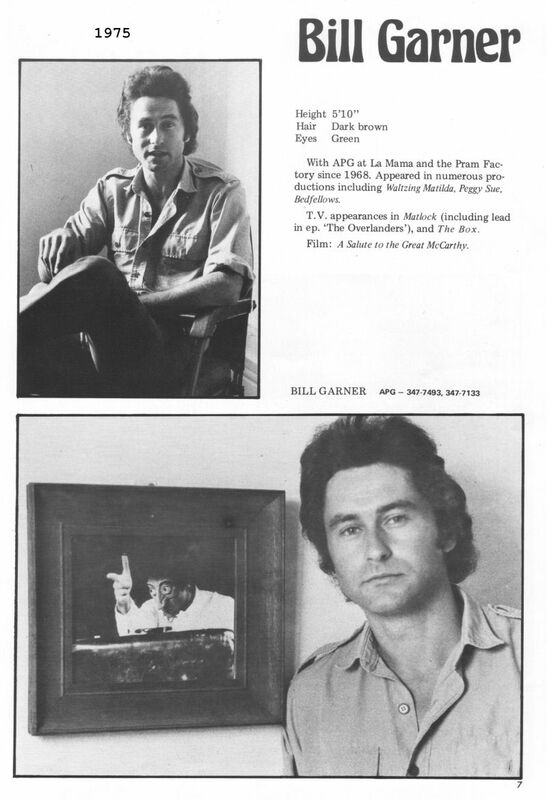 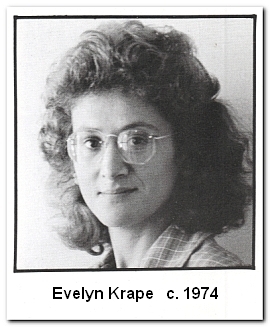 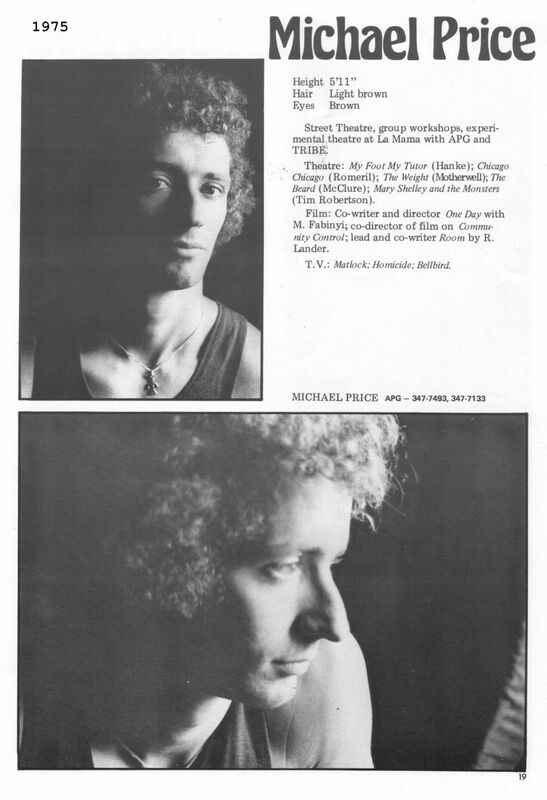 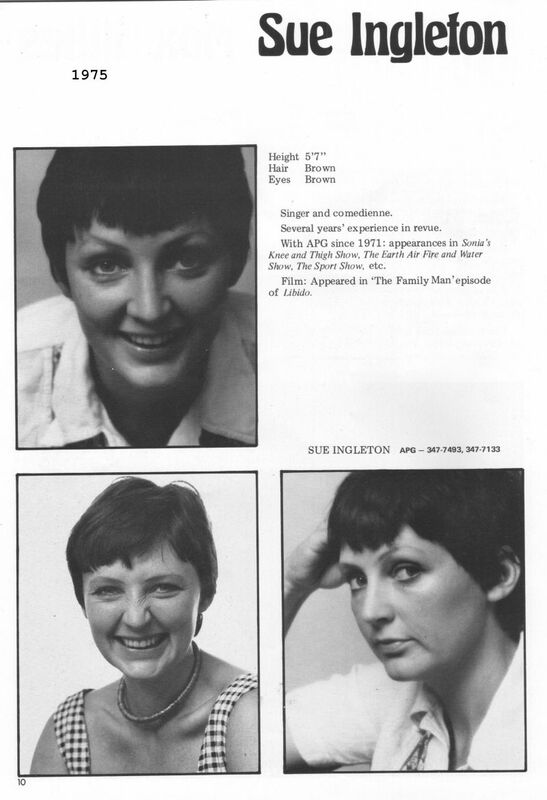 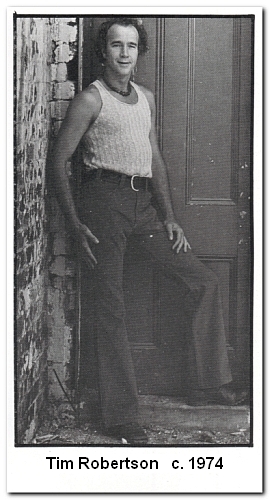 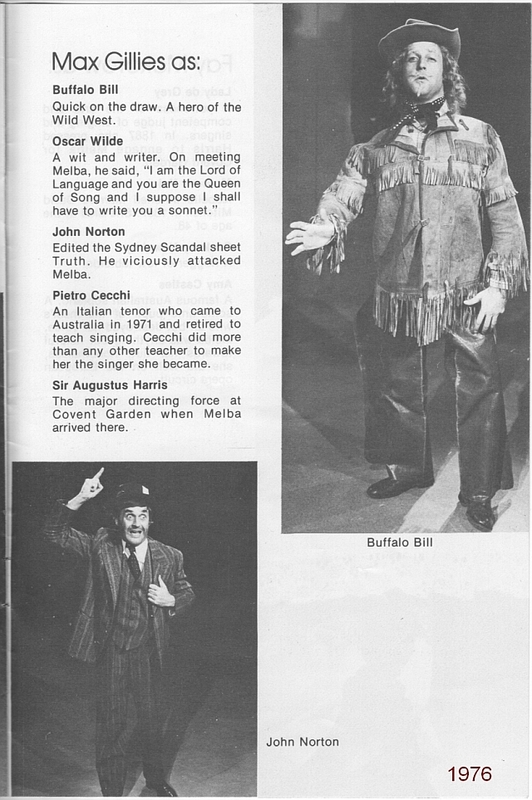 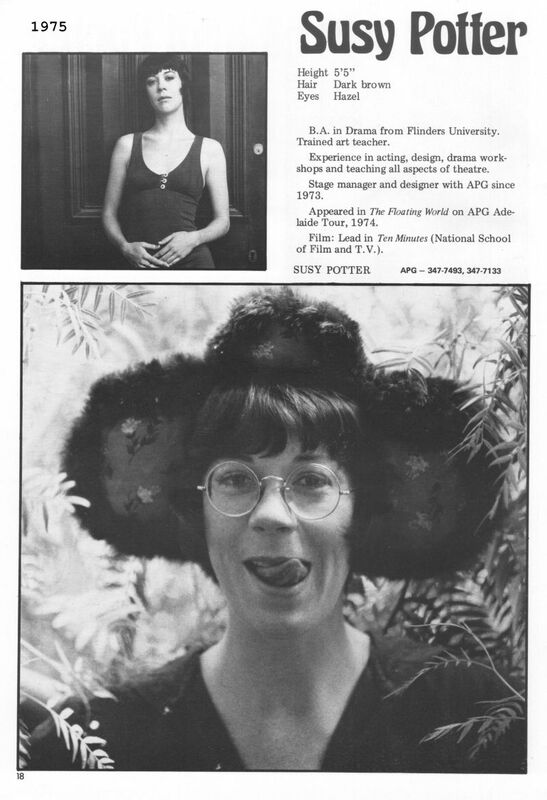 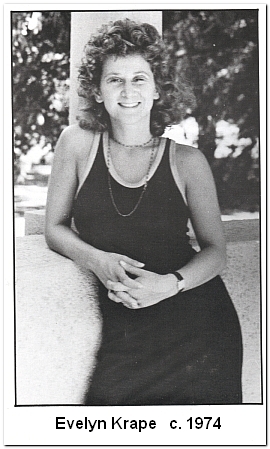 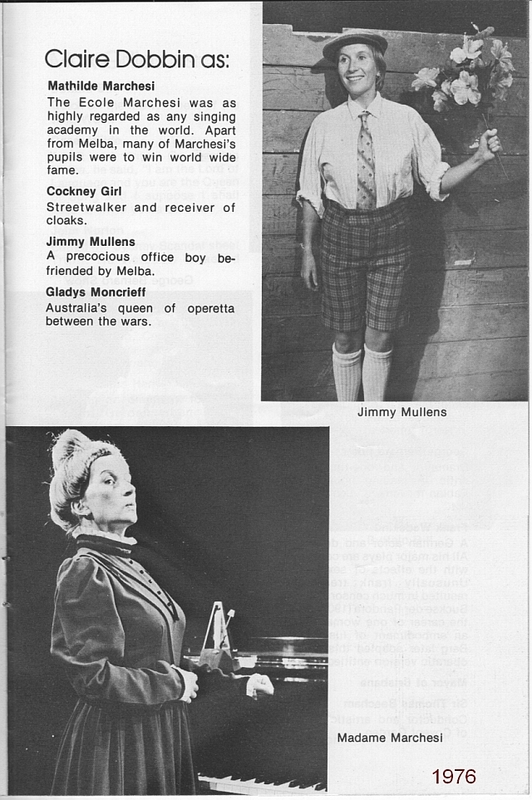 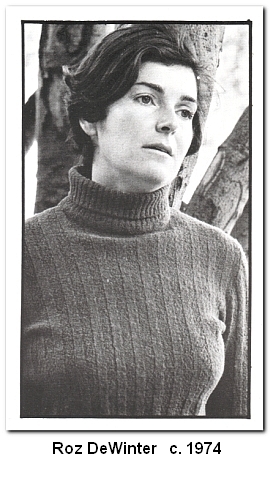 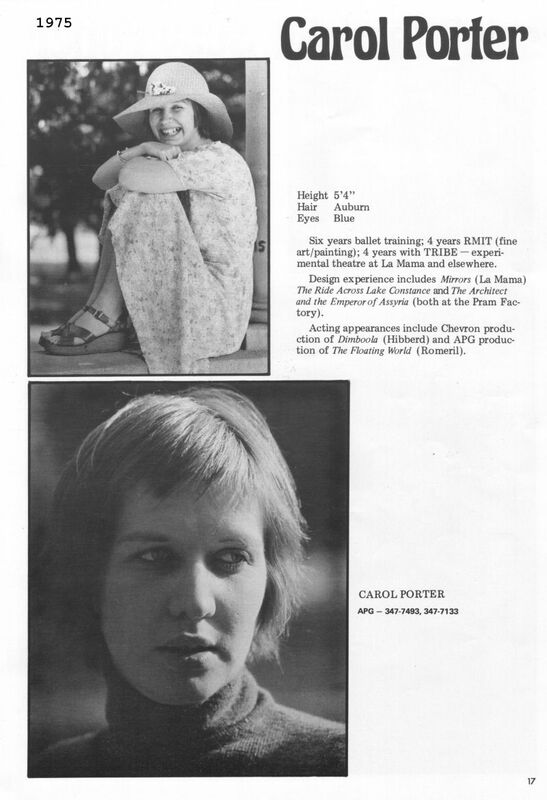 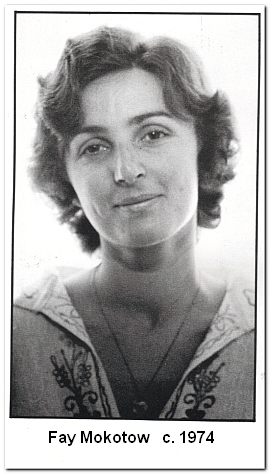 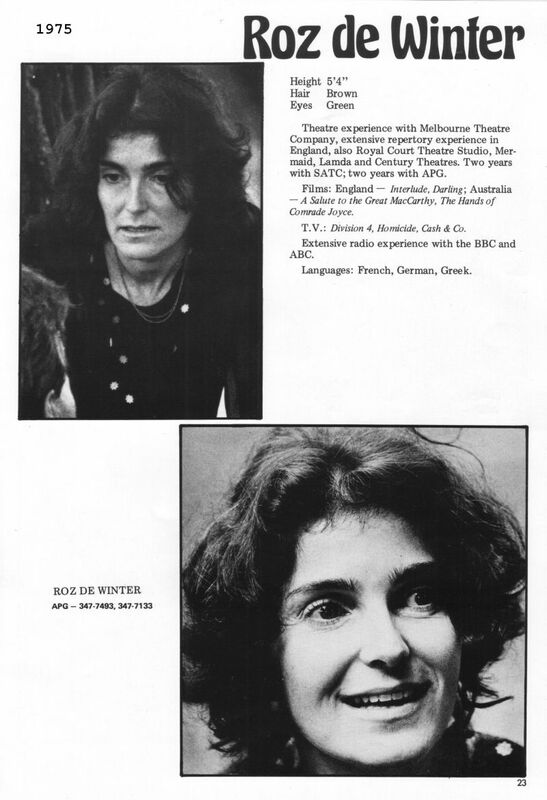 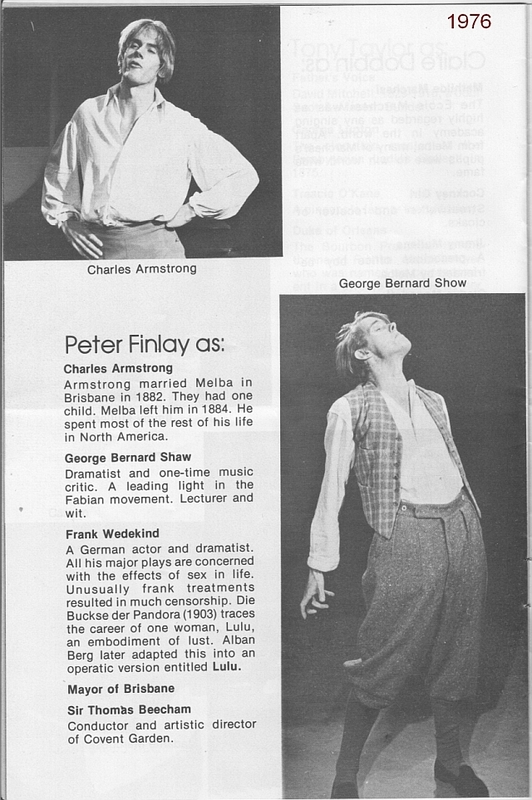 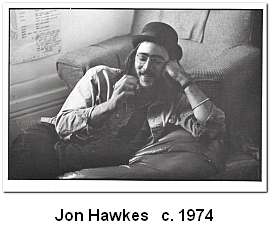 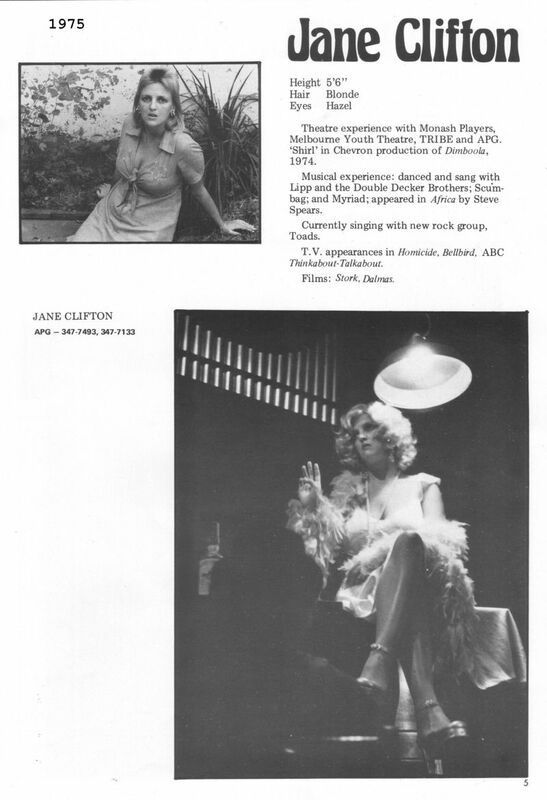 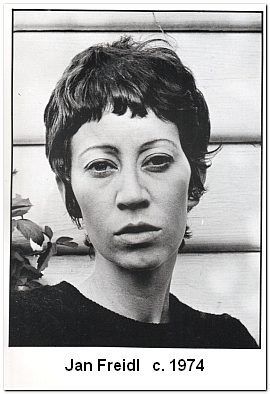 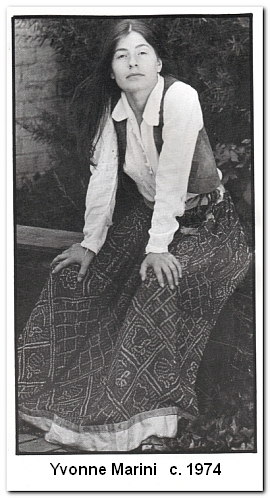 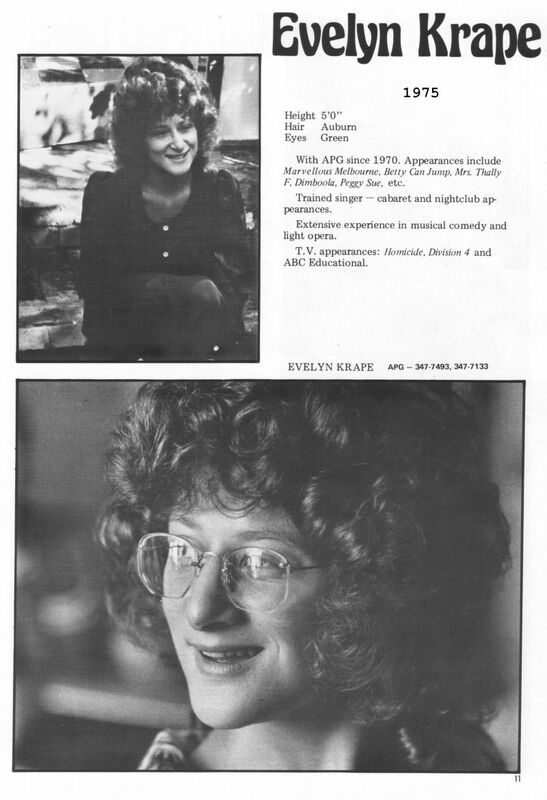 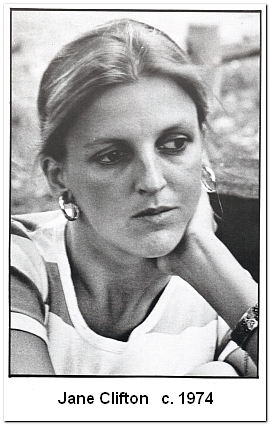 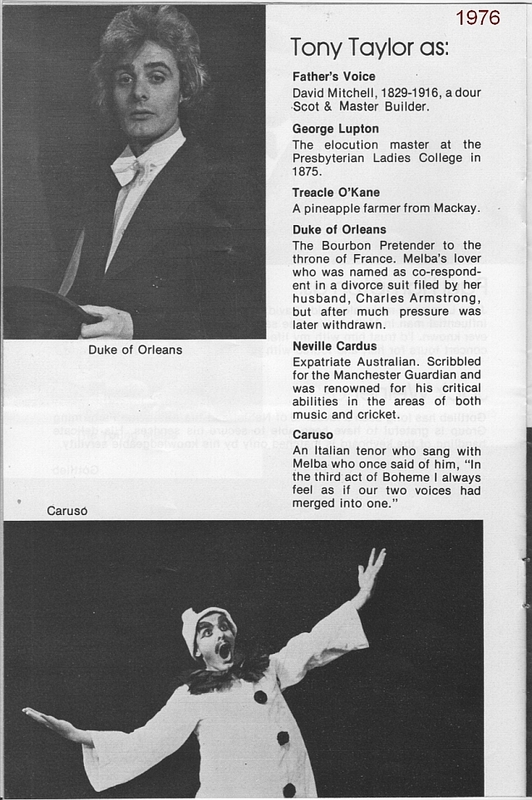 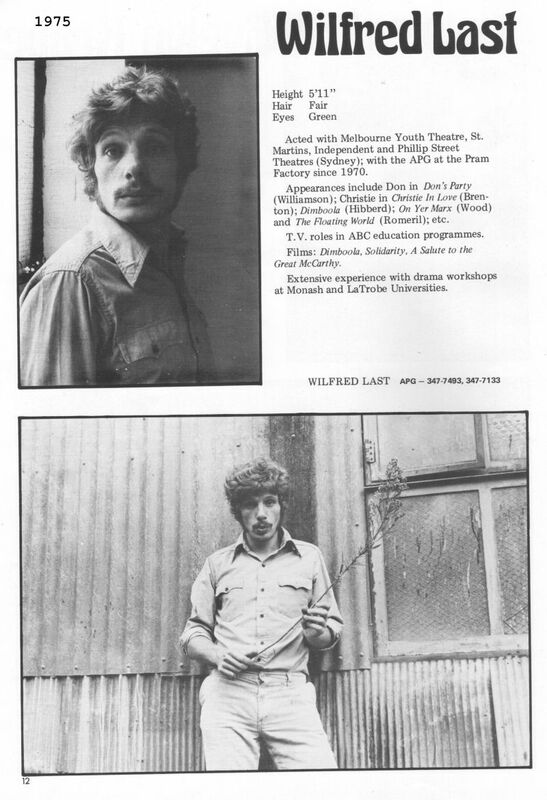 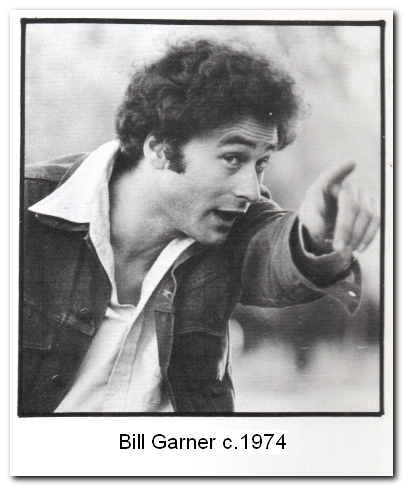 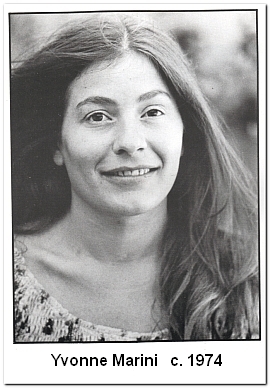 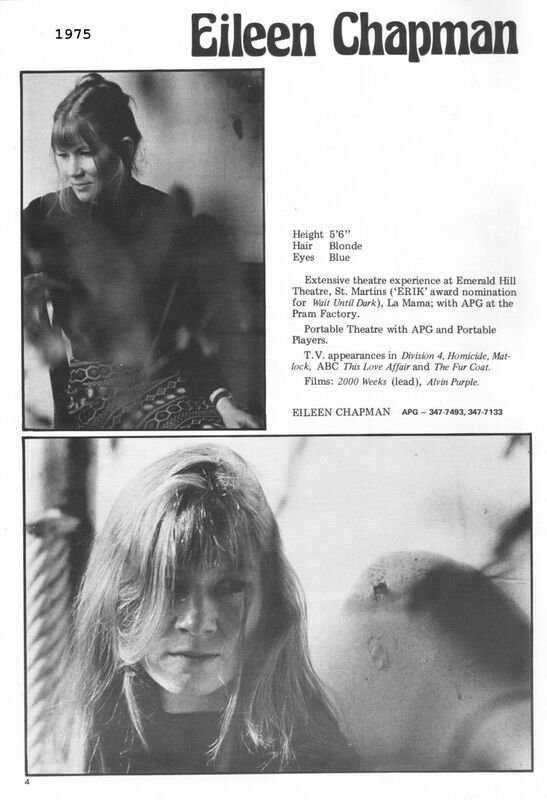 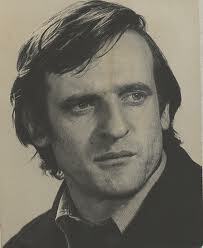 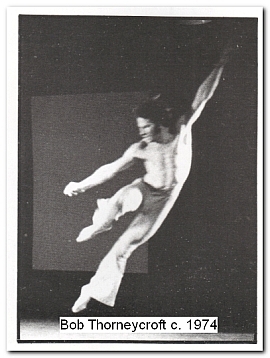 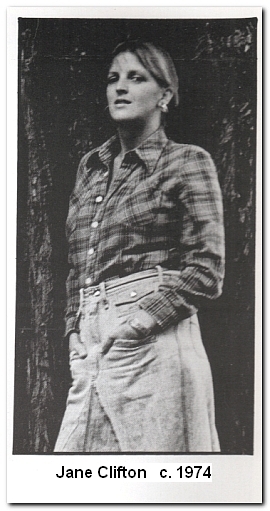 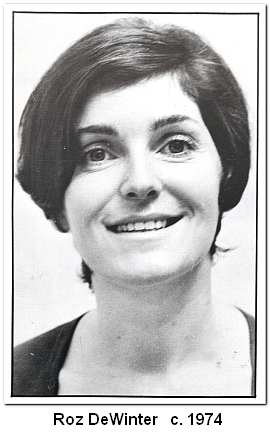 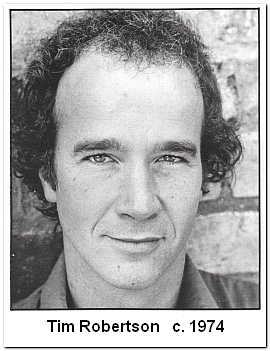 Photographs and text sourced from the 1974 APG Actors Agency brochure.